No doubt it will be the subject of many eminently peer reviewed papers adding the plethora of ‘Pause’ explanations. Unfortunately its not close enough to the equator (and probably not big enough, think Pinatubo). Obviously the third world countries in Sth America carbon footprint just went through the roof, i dont expect them to be excited about the Paris COP as they will now have a hefty bill to pay for their rather high co2 emissions per capita calculation. Maybe it will give them some incentive to balk at all this carbon nonsense then? Where’s them hot rocks when you really need them, eh! That is a sizable dust cloud. If the dust cloud gets blown onto the Andes, then it could be carried very high, and hang around in the stratosphere for years. As James points out, there is nothing quite as satisfying, for your work-a-day alarmist, than having a post-hoc explanation for something that been happening for quite a while. If the dust cloud gets blown onto the Andes, then it could be carried very high, and hang around in the stratosphere for years. I wonder if it will push the dust that is still falling from comet Ison aside to make room for some of this. How about an extraterrestrial dust tax for aliens? So how much sea level rise will this material cause when it has fallen or washed into the oceans? Surely 3 or 4 feet, minimum. Don’t you think that would make for a really scary alarm? If the fire doesn’t get you then the water will do it to you anyway. Double jeopardy, an alarmists dream come true. Those who are concerned about climate change caused by the weakening magnetic field of our planet may also wonder what the stuff is and how magnetic it is. If it retains a magnetic field as it cools amongst the volcanic lightning then this dust may settle after it aligns with the field it is in which is the South Atlantic magnetic anomaly. All while national electric grids on land, hysteresis degauss the land around the power lines. Since you mentioned the lightening, how does that happen? I’m at a loss to explain it unless the volcano is pouring out highly ionized gas or particles. I’ve seen photos and video of eruptions before and never was there any lightening associated with it. Or maybe what I saw just didn’t catch the eruption at the right time? Static Electricity from the particles “rubbing together” in the plume, then being released in the form of lightning. Very common with volcanoes, Mt. St. Helens in 1980 also had spectacular lightening displays in the pyroclastic eruption. Could also be a massive improvement in the conductivity of the fair weather atmospheric leakage current between our two highly charge capacitor plates. Plate one is the ionosphere and plate two is ground. Between them the Schumann reasonance bounces around so the volcanic lightning may be modulated by its frequency (about 7.8Hz). This is the frequency that DNA strands use to communicate. The volcanic dust may also alter the behavior of cosmic radiation Voltages at lower altitudes. Maybe I should have stayed an EE major instead of switching to computer science. Sorry for the delay but this just occurred to me. As I remember my electrical theory, since the power lines run both or all three conductors relatively close together, at more than a short distance from the line there would be near zero net current hence near zero magnetic field. How can that do any degaussing? Maybe 3 phase lines might measure some current at a distance but would that be strong enough? Or am I making an unsupportable assumption? Roy. It is a good question. The answer is that theory and practice are often different. It is true that the three conductors should be at 120 degrees from each other in phase and the vector sum should be zero in the middle but the ground is not in the middle. Also while the power companies would like the load on each of the three phases to be equal it is seldom so. They would also like the power factor angle to be neatly even but it is seldom so. They would like the resistance, impedance and leakage of each line to be the same but they are often not. Consider the instant case of one phase at zero degrees, one at 120 and one at 240. One has no magnetic field. One a clockwise field and the other an anticlockwise. At a distance they do cancel but under one of the two active lines the distance to that line is shorter. Why does sheilded UTP cable exist? Why did coax win out over ribbon cable? The answer to both is that they DO radiate. In this video below a guy plants a large quantity of fluro tubes in the ground under some powerlines. I suspect the electro static field has more to do with what happens. to ionize the argon or neon inside. At the Griffith Park Observatory in Los Angeles they have a Tesla Coil that went on display in 1937. Originally they let it throw its arc to plates on the walls on both sides of the alcove where it sat for many years. That was spectacular enough. But now they have it in a Faraday Cage with all the fear of electromagnetic fields and the RF interference the thing generates. So it now throws its arc to the Faraday cage, a distance of about 4 feet by my estimate. Since the metal cage is a much lower resistance path to ground the arc is even more spectacular. It will light up both fluorescent and neon tubes even outside the Faraday Cage. I’d like to see the arc it would have if out in the open with nothing around it. They don’t give the voltage it generates but 4 feet takes a lot of EMF. Here it is in operation, as it’s demonstrated by an observatory staff member. And a longer one capturing the narration along with it. In spite of the guy’s saying it wouldn’t light up anything outside the cage, I’ve seen it light a fluorescent tube in the operator’s hand outside the cage. So much for a Faraday Cage. Quite obviously it does some things but not others. I think you’re right, it’s the electrostatic field in the power line demonstration. also the tesla coil. Coax hasn’t entirely taken over the world though. Ethernet cable uses twisted pairs and if that’s done right there isn’t any significant radiation and there’s no pickup of unwanted stuff from the environment. I’ve been told several times I would have trouble by coiling up excess cable at one end or would have trouble running several cables close to each other. My reply is always, “Either twisted pairs work or they don’t. If they do there’s no trouble and if they don’t, ethernet as we know it would be impossible.” I’ve never had a single problem doing what I was advised against. Long haul high voltage power lines, except DC, reverse (single phase) or rotate (3 phase) conductor positions every so often for the same reason ethernet uses twisted pairs. You can see this in numerous places where power lines parallel highways. If I had remembered this I would not have had to ask the question in the first place. Thanks for the Tesla coil stuff. Like the way those lamps light up. What would the planet be like with Tesla’s global power system altering the way our magnetic sheild fights off solar flares, altering lightning behavior, and DNA activity. The twist in the power transmission lines does help to balance the phases but the rocks and things around the lines are still being degaussed because the magnetic radiation goes around not along. See Flemmings left and right hand rules. That is why i mentioned sheilded UTP. See also STP and S/STP. For Radio and TV transmission and reception with coax and ribbon. The balanced type cables are not used much at all anymore. Have often thought single phase house wiring should have used the balanced approach. Instead of an active, neutral and earth you would have in phase, out of phase and earth. This would lessen the radiation in the home and reduce the Voltage of most electric shocks to half. In the war between the waveguide method of coax and the balanced line method of ethernet over long distances the winner seems to be optical fibre. Have you ever tried an AM radio on a weak station in one of your ethernet coils? Caused by Global Warming, of course. Goes without saying, obviously unprecedented global warming has expanded earth’s crust causing unnatural volcanic eruptions. Don’t give them further ideas/excuses! Do I smell an academic study/research paper about modeling the earth’s crust and global warming brewing? In your own time apply for that research grant! This is completely off topic and an impertinent question all the way around. But my curiosity is bugging me. A day or two ago I was searching for all your comments to find everything you said on the topic and I noticed that you use a zero between tom and mason, something very unusual to say the least. What is the significance of that? And if I’m out of line you can tell me so. But curiosity is too strong an incentive not to ask. Years ago, I was employed at a company that already had a Tom Mason working there. As I have no middle name or initial the IT people gave me the logon name of tom0mason to differentiate us. I’ve used the name since. Nothing very strange really. Did you find all my comments? Thanks. And yes I found them all. When it didn’t work with the expected letter I realised it must be a zero. Damned planet earth! How could it pollute the earth like that? We should put that volcano on trial at the UN for crimes against sustainability! Off topic – here is a disturbing article at the Conversation. Jo, please consider a post on these people. They are dangerous to democracy. Not a new idea. If you were to refer to Lord Monkton’s comments (2015 in California) on the political drives behind this agenda you will see a strong comintern influence. Dr. Moore’s comments (ex founder of Greenpeace) also has some important observations on how the rational environmental movement was hijacked by political extremists some years ago. Recordings of both can be found on Youtube, well worth a viewing. When I was a little boy, I was fascinated by dinosaurs, volcanoes, and airplanes, in that order. If I could have seen the above color picture back then, I believe volcanoes would have been first. That simply is a great picture, fills me with wonder and awe. I’ve seen several articles, at least one on WUWT, linking increased volcanic activity with decreased Solar activity. Is this merely correlation or has there been work confirming the connection? The exact number of volcanoes is unknown. It also depends on the definition of a “volcano”: for instance, there are “volcanic fields” that comprise hundreds of individual eruption centers (such as conder cones, maars, shield volcanoes) that are all relataed to the same magma chamber and that may or not be counted as a single “volcano”. There are probably millions of volcanoes that have been active during the whole lifespan of the earth. During the past 10,000 years, there are about 1500 volcanoes on land that are known to have have been active, while the even larger number of submarine volcanoes is unknown. At present, there are about 600 volcanoes that have had known eruptions during recorded history, while about 50-70 volcanoes are active (erupting) each year. At any given time, there is an average of about 20 volcanoes that are erupting. So the chances of volcanic activity plus major Earthquakes, another phenomena that is also supposedly related to solar activity all have a very good chance that a large number of eruptions will occur during any selected period. However it does appear that volcanic activity moves in cycles as there has been discussion on the quite high volcanic activity in the 19th century, the 1800′s, compared to the quiet and low amount relatively speaking, of volcanic activity of the just past 20th century. Australia’s volcanoes and yes, we have one down on Heard Island that regularly erupts and the adjacent McDonald Island volcano also began erupting in 1992 after some 75,000 years of dormancy. As I live in western Victoria and about 150 kms or so from Australia’s newest Volcanic province which stretches from Mt Gambier eastwards into the older Gippsland region centre of activity I am pleased to say that no eruption appears to be imminent in this area as the last series of volcanic activity around here has been dated at 2900 BCE, 3000 BCE, 5290 BCE and 5850 BCE. Nor do we have to be concerned about Queensland’s rather interesting Undara volcanic province, a couple of hundred kilometres south west of Cairns where the last eruptions occurred around 190,000 years ago. Kevin, there are papers trom a geologist at Columbia U IIRC that assert such a connection. I read them and found them worse than suspect. Cherrypicked weak regional correlation is the kindest thing thing that can be said. Volcanism has two sources: plate tectoniks (This one) and mantle plumes (Hawaii). You are probably right, but I thought that there was a connection to the sun and planets based on some online articles I read. Perhaps if some of those folks out there have that info, they will post soon. Ash might look light but it is considerably heavier than snow. Dry ash is about 1,600 kilograms per cubic metre but wet ash is much heavier. Any flat roofs covered by 4ocm dry ash would have more than 600kg of ash per square metre and likely face collapse. Ash cover on grass, forests etc will result in tree collapse and smothering of grass cover. Ash mixed with water will form lethal slurries down the rivers draining the mountain, killing fish life, filling dams and covering lowlands. Minutes of meeting of a likely local Greens focus group follows. Fellow CAGW activists have warned the world about this sort of consequence of increased CO2 levels.This eruption must be man-made in some way too, mustn’t it? 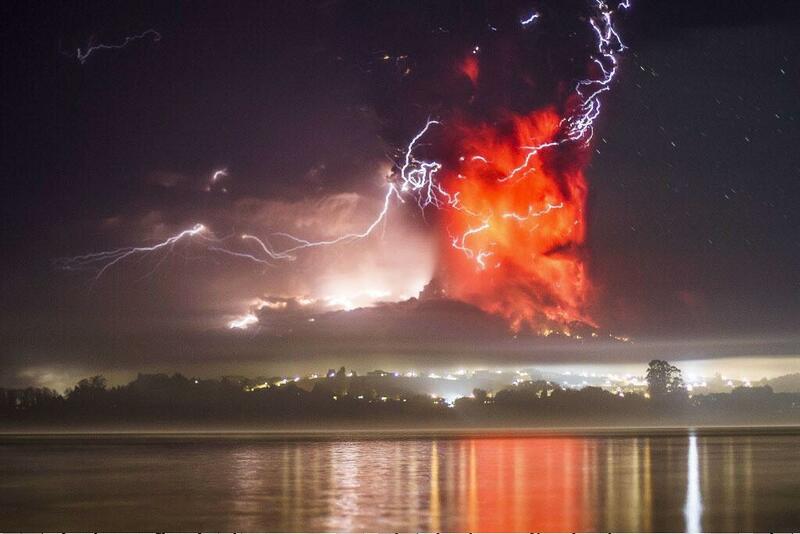 Chile must pay a carbon tax on that. Whoopee! Cheque to UN or global Greens activists please! A receipt will not be sent to you in order to save paper and emphasise the need to avoid fossil fuels. We know you’ll understand. Don’t worry, we’ll keep in touch so that you can still contribute funds to us. Do you prefer post mail or email to receive our save the world campaign material? I recall that my climate scientist friend and I calculated the co2 emissions from Pinatubo once, but I no longer recall the numbers. It drawfed what man can put out and control, though, even over prolonged periods of time. How much co2 is this one putting out? When Pinatubo erupted there was actually small but measurable global cooling – from sulfur dioxide emissions. Yes there were also enormous volumes of CO2 emitted but any effects on global climate from CO2 was dwarfed by the cooling effects of SO2. It will be interesting to see if the Calbuco eruption is large enough to have similar influence on global climates – that is doubtful. Yes, the aerosol factors. We also did the calculations on St Helens. Wish I could recall the numbers. The interesting thing is that I recall the numbers were massive. What does that say about the correlation of co2 and warming? It also gives us an indication of how well nature handles such events and continues the co2 cycle. It further shows how little we can do to control, and to contribute, with man made co2 emissions. Our impact is so finite and insignificant one way or the other. The best evidence of high volcanic CO2 are studies of Nyiragongo and the Lake Nyos seeps. Not all volcanoes are similar, but it’s obvious to me that mainstream estimates of total volcanic CO2 are an order of magnitude low. Nature in an instant wipes out the scientific – govt community’s forward projections. We only need enough volcanic eruptions to introduce some real climate change to the planet. Indeed, you are very correct when considering volcano dust and the effects of high altitude sulfur gases, can linger for decades in the air. Nature in an instant can introduce some real climate change. the recovery is fairly swift. And yesterday geologists in the US announced the results of scientific testing and observation of the Yellowstone caldera, showing an immense pool of molton rock is pressing against the caldera, expanding it slowly. How long before the yellowstone mega volcano lets go again? No way to know, tommorrow or millions of years. That is one frightening looking event — never mind the implications for climate, short term or long. Imagine if we could harness that energy. Nice dream, Roy. The danger to anyone withing range of smoke, ash and lava is deadly. Having seen what Mount St. Helens did in 1980 I’m happy to be a long way from this one. Nature is still the boss and we’re still puny little creatures who must run from her fury. There is something indescribably awesome about lava. Especially in person, in real life. For those with the fitness to climb the mountains and go there, I can definitely recommend it. It is too easy to have a mediated life, seen through video or stories. It’s quite another thing to see it for yourself. In his book “Eruptions that Shook the World”, Clive Oppenheimer, a volcanologist at Cambridge University, puts the number killed by the ash flows, the tsunamis and the starvation that followed them in Indonesia at 60,000-120,000. That alone would make Tambora’s eruption the deadliest on record. But the eruption did not restrict its impact to the areas pummelled by waves and smothered by ash. The year after the eruption clothes froze to washing lines in the New England summer and glaciers surged down Alpine valleys at an alarming rate. Countless thousands starved in China’s Yunnan province and typhus spread across Europe. Grain was in such short supply in Britain that the Corn Laws were suspended and a poetic coterie succumbing to cabin fever on the shores of Lake Geneva dreamed up nightmares that would haunt the imagination for centuries to come. And no one knew that the common cause of all these things was a ruined mountain in a far-off sea. And of course there had been Laki in Iceland in 1783. The Corn Laws refers to Wheat, Oats and Barley, not maize. 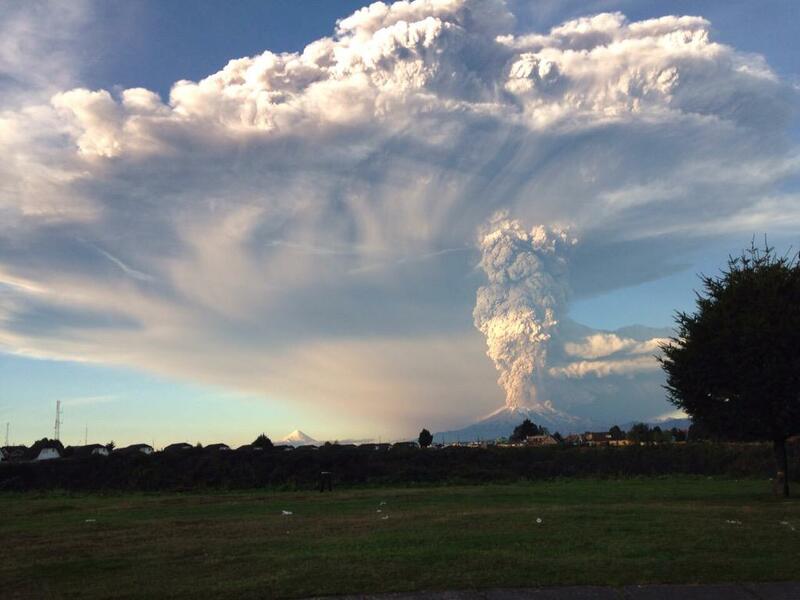 Over at http://iceagenow.info/ there are now 4 separate videos of the eruption, starting at ‘Red alert in Chile as Calbuco volcano erupts (Video)’ on April 22, 2015 at the bottom of the page, all the way to today’s at the top. As usual there are also reports of unseasonably cold weather in the US, Romania and Turkey in between the Chilean volcano eruption reports. There are numerous links provided. The relationship between the volumes of erupted Tephra depicted here are interesting and provide some idea of the amounts of material that are thrown into the atmosphere from the various eruptions. The last lot of Yellowstone eruptive tephra probably wouldn’t fit on the page in the same depiction. What struck me was the fact that one of the largest LIP’s in the depiction of the global LIP’s is given as in the same region of the western Pacific as the Pacific Warm Pool, the largest such warm water pool on the planet and the source for the warm El Nino waters and consequently perhaps one of the main planetary climate controlling factors. As a time,it is said,’the sky fell’. …..am I the only one that can see Satan’s face in the first picture? Maybe its just a manifestation of my bottle shop.